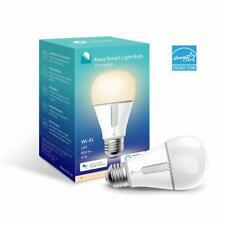 DIMMABLE - Kasa Smart’s dimmable light bulb has a dimming range from 1% to 100%. Set the right brightness for any mood or activity. Turn your bulb to full brightness to get your kids up in the morning or dim it enough for them to fall asleep at night. EASY TO INSTALLATION : No hub required, no need to buy complicated expensive Bridge, the built-in Wifi makes you enjoy the smart life after you downloaded the APP and installed the bulb. This 6.5W Energy-saving LED light bulbs is equivalent 60W common light bulb. Bulb Shape Code:E27. (2)White light and colorful light are available,RGB create your favorite light effects with 16 million colors. Color:RGB White. Energy Saving:This 7W 700lm LED bulb is equivalent to a 60W traditional incandescent bulb, saving up to 80% energy. Light color: white RGB. 16 million color optional, create the atmosphere you want. You can also easy to choose any white color including warm white, pure white and natural white. With this app you can manage you smart led light bulb by smartphone or tablet, including adjusting brightness and set up scenes. Brand new, sealed, in stock. Free super fast delivery. Light Color : White, RGB. ◈ 250 Labels per Roll. ◈ 450 Labels per Roll. LED Fog Light. LED Christmas Light. 16 million color optional, create the atmosphere you want. How to Use with Amazon Alex. HARD DRIVE CADDY COVER. No hub required, no need to buy complicated expensive Bridge, the built-in Wifi makes you enjoy the smart life after you downloaded the APP and installed the bulb. This 6.5W Energy-saving LED light bulbs is equivalent 60W common light bulb. 60W equivalent - uses only 9W. Change to any color or choose a color temperature. Remote access from anywhere using a free app - Alexa or Google Assistant not required. Original / factory / manufacturer's warranties are no longer valid. Never Used. Best Deal Out There! 1pcs x E26 A19 9W RGBW LED Bulb. Replace 60W incandescent bulb by 9W LED bulb. Save 85% energy. The light can help to improve the atmosphere of all kinds of parties, celebrations, activities, etc. Finally, a smart bulb to replace your regular lights! Manage your lighting from across the room or across the country, using the Geeni app or (optionally) by voice using Amazon Alexa, your Google Assistant or Microsoft Cortana. KASA SCENES & SCHEDULES - Schedule the Smart Bulb to automatically turn on and off when away. NOTE: Requires a secured 2.4 GHz Wi-Fi network connection. The most effective way to reduce waste is by not creating in the first place. 💡【Energy Saving & Safety】- In cool white light condition, equivalent to 60W traditional bulbs, saving power up to 88%; A19 LED smart bulb no hub, safe and easy to use. Dimmable LED Bulb. 16 million multicolor adjustable, decorate your house with romantic lighting. These are 3rd generation with Richer colors. Important note about 3rd generation White & Color Ambiance - there are 2 different versions of these bulbs. Even if you don't request a certain version I will never send a mix. 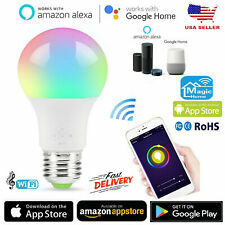 Features: Voice Control: Control your bulb Compatible with Alexa and google assistant ，Control your bulb turn light off/on & Dim brightness and turn color. 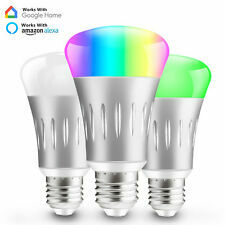 Works with IFTTT: DIY your WiFi light bulb depending on various events by connecting it to IFTTT. Music Sync :Sync light to your favorite music and enjoy every beat to the fullest. Transform any room into a dance floor, or create a relaxing and tranquil atmosphere. This is a great way to relax. Extensive Applications: The smart wifi bulb is remotely .Multiple lighting pattern, suitable for bedroom,Living room, Kitchen, Desk lamp, Bar, Hotel, Night Clubs, Wedding decorations, Party..
Op en box in new conditions. Plug in and light up your outdoors. Simply plug in and connect to your existing Hue bridge to enjoy the 16 million colors available to enhance the beauty of your yard or create any ambiance you like. You can even create IFTTT (If This Then That) recipes via the cloud-based service to program automatic cause-and-effect lighting. Your movie starts and the lights dim. The action begins with a high speed chase. Trending at $22.85eBay determines this price through a machine learned model of the product's sale prices within the last 90 days. Pair it for automation with your existing Nest or Samsung SmartThings system. Appear new. Updated them to the latest software while testing. Item color: White. Item part number: 453092. This 6.5W Energy-saving LED light bulbs is equivalent 60W common light bulb. EASY TO INSTALLATION : No hub required, no need to buy complicated expensive Bridge, the built-in Wifi makes you enjoy the smart life after you downloaded the APP and installed the bulb. No hub required, no need to buy complicated expensive Bridge, the built-in Wifi makes you enjoy the smart life after you downloaded the APP and installed the bulb. This 4.5W Energy-saving LED light bulbs is equivalent 60W common light bulb. Trending at $11.66eBay determines this price through a machine learned model of the product's sale prices within the last 90 days. No Hub bridge and other switches required. A gentle sunrise can wake you up in the morning gradually. By using the APP you can turn off the lights after you left the house. And turn them back on before you walking on the door. 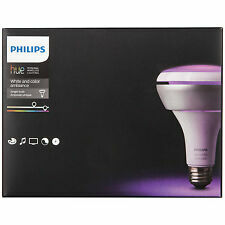 The Hue White and Color Ambiance A19 Starter Kit contains the Hue Bridge and four White and Color Ambiance Hue bulbs. 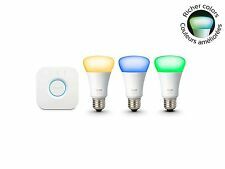 Now with richer colors, this kit forms the basis of your Hue Personal Lighting System. Enjoys fun of DIY: Up to 10 blocks can be spliced together to make various shapes, shows gorgeous & amazing effects and creates romantic & joyful atmosphere. Low power consumption and energy saving. Hexagon design, 19 LEDs of each light block and no dark area on the surface.